Let's see how much media stops talking about Trump for 5 seconds to talk about how the US Empire is sponsoring endless massacres. What Saudi Arabia is doing in Yemen is not any less brutal than what Israel did in Gaza. No arms should go the Middle East. PERIOD. All those criminals should be brought to justice. I saw this a while ago, and was so sickened by it. People probably will hardly even pay any attention to this despicable act. The response to all the carnage is too often just people griping about the refugees who have to go somewhere, or stay and be starved and killed. Glad you're back, and I hope doing well, Dandelion. Good to know that Dandelion can see Saudi Arabia and Yemen from where she is. I hope that means the worst is over for Florida. Well, at least until the election! Make no mistake, this is the U.S. playing hardball, where none is required. Shocking, but sadly no longer surprising. The US isn't the only country that rather paid attention to the Trump tapes or electoral debates, it was much the same in Europe too. Our news had dis have a small item on it, which mentioned: "Commenting on the attack the United States have indicated to reconsider the support by Saudi Arabia-led coalition in Yemen. Americans are 'very concerned,' said a spokesman for the National Security Council." As if that hasn't been said before. Of course they were also quick to point out that no planes of the coalition were in the area at the time of the attack. I( am so dawg-dammed SICK and tired of constant, never-ending war. All over the world, everyday, innocent people and CHILDREN are blown up, maimed, murdered and basically butchered and for what? WHAT????? Empire? OIL?, Gas? Minerals and precious what-the-****-ever???? I truly do not have much faith or confidence that Man, in Its WILLFUL ignorance and over-the-top-arrogance, will ever rise above Itself from Its own depraved barbarity of the soul. In all this time, down through history, we as a species apparently have learned NOTHING and prefer to continue to give in to our lesser selves. We are not evolving, we are de-evolving into willful idiots, Lemmings and sheeple. And the Bible-Thumpers want us to believe we are put here by a God.......all I see is PROOF of EVOLUTION, and the lack thereof....I see no "Hand of God" in any of what's going on in all these war-torn countries that WE (yes, OUR NATION) SPONSOR or outright participating in. NONE. OK, I'll get off my soapbox now. Rant over. Because - don't overlook (or forget) that the military industrial complexes NEED military support (be it Saudi, Israel - even Syria, Pakistan's unstable NW ....) in order to make profits & further develop their killing capacity. All these deaths feed data back to the developers - and "PEACE" is not in their vision of the world as they want it to be. I don't know what to say, but most of all I wish I knew WHAT to do - DAMMIT!!! The State Dept. 's "strong condemnation" equals the hundreds of "strong condemnations" for Israel's crimes, Sam is exactly right. Should we believe those suggestions they may take a closer look at their weapons exports and support of the Saudis? Not until that bill has passed to both, CANCEL the latest $ 1 billion or so deal AND limit severerly if not end that illegal support MAKING US complicit in war crimes. Yet, Hellary won't give a damn in her coziness with the Saudis. I should add: same with the promised *COMBINED* investigation together WITH the Saudis-LOL, as always and like all those IDF and Pentagon in-house investigations. You either never hear from it again or are presented a LIE. Whats some US-made cluster bombs and some hundreds 'collateral damage' against the'Shia /Houthi enemy'; compared to Syria's and Russia's 'barrel bombing' and "gassing their own people". We won't hear too much about the first I guess. As long as they can keep Trump front and center he will be the distraction from the reality of the murder of innocents. In less than a month there will be a new force in the world to deal with. A new american president. Another distraction. What's it good for ? war ? it's endless . Signing petitions is one thing. . . VOTING the RIGHT person into office to make a difference from the top is what is required. It's not like this hasn't been going on quite awhile---our media focuses on the personal side of the candidates, the gossip, and not the real issues that are so important to voters. I can only hope that more people are noticing this. Yes, we are 'creeping' into worldwide war. It is good for defense contractors, weapons makers, and those holding stocks in those corporations. Unfortunately, Trump was correct with some of his comments on foreign affairs during the Town Hall last night. I surprised myself agreeing with him, (although I am deadset against him on domestic and social issues). On the issues regarding Syria & Aleppo, I was disagreeing with Clinton's answers. It does sound like she is happy with the status quo, while women and children....innocents....are dying. We ARE arming the Saudis; and with weapons like cluster bombs---just hideous! And, she is perfectly happy to continue regime change anywhere she likes---beholden to her Corporate/Wall Street masters. If she REALLY cared about women and children, she would not have introduced fracking to other countries, and would stop arming other countries. What kind of Secretary of State does that?! Our sympathies to the Yemenis and our utter contempt to the barbaric Saudis To its discredit the American administration has supplied the equipment to Saudi Arabia and still supports it.As others have stated our petitions have achieved nothing and most likely more will go the same way. Lois - I do so agree with you about that segment of the debate! I never thought I'd be nodding my head when Trump is speaking, but there was part of the foreign policy discussion where I (reluctantly) had to admit - I agreed with what he said! Didn't last long! I was soon back in "GRRR" mode ... often with both! Thanks a lot for posting, Dandelion. Thank you also for being such a sensible and sensitive person. I very much agree with you Lois - I have been saying that Trump is actually better on foreign policy than Hillary AND Trump also is very clear he does not want TPP. They are BOTH extremely flawed Candidates however if he would keep us from getting TPP and into more wars that is a BIG plus. Hillary runs on the one thing she did for children with making sure all children under age 18 living in poorer families would have medical care. Yes that was important - but having Universal Health Care would be the best and she has already said it isn't going to happen. Also if she cared so much for women and children it should be all children and all women - her speeches mean nothing to those women when they watch their homes and children being blown to pieces. I'm back, on and off, internet comes and goes and I'm still doing clean up after the storm, but getting there a step at a time. This is a war crime of the highest magnitude. Thanks for posting Dandelion. Trust the usual Israel hating nitwits to try to put the boot in and defect attention from this terrible massacre. I have a thing against any nation that perpetuates WAR by fueling it, and funding the various organizations that engage in it. Neither Clinton or Trump ARE fit for office. I don't always agree with him, but his posted stories are almost always worth following through & reading. Just because people posting stories don't share Shayla's priorities, doesn't give the right to insult people. Clinton and Trump are BOTH unfit for office. Jill Stein’s responds during 2nd Presidential Election debate. She was speaking about Yemen in the beginning clip that showed her accepting the nomination of the Green Party back in the summer. Noted, Dandelion, and thanks. Shocking event in Yemen. "When will they ever learn" . . . the US of A, and stop arming Saudi! 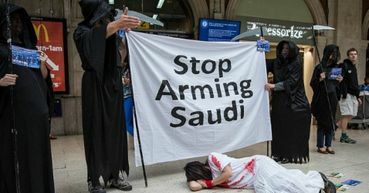 UK also needs to stop arming Saudi Arabia as well. Thanks Darren for the link on Jill Stein. Why would Americans not want her for president over Clinton or Trump, I wonder. Yes, Dandelion, UK needs to stop as well. It seems to me this is Saudi Arabia (Sunni) and Iran (Shia) are fighting a proxy war in Yemen. I hope the Iranians do not feel obliged to step in and escalate the violence. There is mayhem already. This incident is another war crime from the Saudis. A lengthening list. Yes, the UK is also propping up Saudi aggression here - and while trying to change the policies by choosing who one votes for - when one has a vote - is part of what one can do, there is also OXFAM's call which one can support by signing and sharing as widely as possible. Yes Judi and thx for posting that link-you beat me to it. signed earlier from email. There are currently 3,666 signatures. NEW goal - We need 4,000 signatures! Signed and shared that petition, JL A. How horrible. Thanks for bringing it to attention. The only way we stop War being fueled and funded from within the UK, is to remove the war mongering Tories (Conservative/Republicans) from power, and get Jeremy Corbyn running as Prime Minister. "Stop endangering U.S. troops in the Middle East!" - ??????????????????????????????????? What about the civilians in Yemen? The US has chosen to place troops in the Middle East - US foreign policy. Which already upsets many - and has certainly contributed to the drivers that have allowed extremists to mobilise support for Daesh, and for anti-Western society actions. And in each of the places where conflict has broken out, the heaviest human price has been paid by civilians - especially civilians who don't have the means of fleeing to safer locations, i.e. the very poorest. Who die under the shellings, the bullets, the bombs often originally paid for out of our tax-payers' money, used for military aid. While I hear what you are saying Evelyn concerning the civilians, we must realize that in order to stop this the approach must come from many various angles. As you can see by the rise of Trump, there are some who only see things from a personal level and have been conditioned by the propaganda to believe that all those civilians "them" or somehow the enemy as well. They can relate to the American troops but might not go beyond that. If a narrow focus obtains signatures and voices to raise the outcome will be the same, stopping the bombs from killing more civilians. "typo" civilians "them" or somehow should of wrote "them" our somehow the enemy as well. There's some really bad stuff brewing, perhaps in the making in that conflict and with US complicity. Voices are already drawing the parallel with the Tonkin Golf scam after that US missile strike on Yemeni radar installations. I wouldn't doubt that at all! Environment damage caused by war, it's not even factored into the equation is it? Shared all over social media to spread awareness. You are right Darren W.
Saudi Arabia is known to be have facilitated the 9/11 attacks and fund ISIL, but why does the monarchy get so much leeway from the US? Souciant.com's associate editor Zenab Ahmed takes up this question. Shared that Real News article footage over social media, JL A.